Today we continue our look back on Liverpool's treble of 1983-84 and get the lowdown on the leader of the team, Graeme Souness, who was rightly known as the most feared midfielder in Europe. Tony Evans, sports editor of The Times, releases his brilliant new book, 'I Don't Know What It Is But I Love It' on Thursday - telling the story of an unforgettable campaign under Joe Fagan. Back in 1983-84, Evans was a Kopite who never missed a game home and away, and in an exclusive chat with Liverpoolfc.com, he tells us just why supporters should never forget just what an inspirational player Souness was for the club. 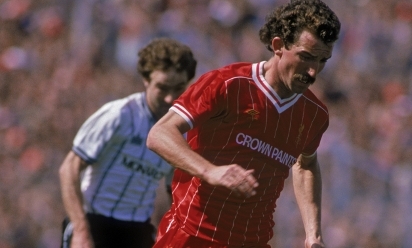 "Souness was immense that season and it was a sheer joy to watch him," Evans told Liverpoolfc.com. "In terms of being the leader, in terms of being the dominant midfield player, he didn't take a step back to anyone. The man just exuded style, arrogance and brutality and he had plenty of skill - he had it all. "On the pitch he was this presence beyond almost anything I have ever seen on a football pitch. He had a mean streak and he just had everything. He was an absolute joy to watch." 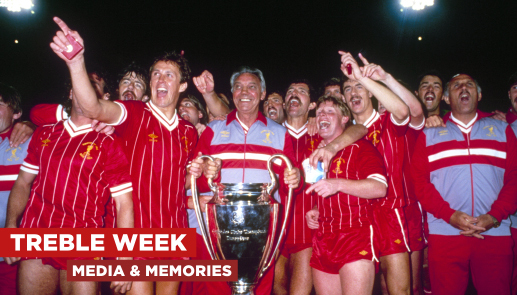 Tony, let's take you back to the 1983-84 season which must bring back wonderful memories for you? It was one of the best seasons out of all the 1980s. We had a great team and obviously at the start Joe Fagan came in and everyone was wondering how he would respond and take the team on after Bob Paisley. It turned out to be an amazing rollercoaster. One of the mad things, looking back, is that this team went on to win the treble and yet it was our lowest gates that season since the old second division days. Liverpool, as a city, was very different back then and the low crowds were in part down to the recession during the Thatcher years. It made it even sweeter though that we won things because the club was the flag-bearer for the city and the culture. We might have been under pressure economically and politically but the team went on and won everywhere so that was brilliant in that sense. People consume football differently these days and they see it through the charisma of the television screens which only shows you a little bit about it. In those days football was seen very little on the television although the 1983-84 season was the first time they started showing live games. So to see the majority of the matches you had to go along to it and that was one of the great joys as you saw what other people didn't and it was fantastic. The timing of the live games was strange as they were staged on Friday night's and Sunday afternoons. I remember the derby game at Anfield which was a 2.25pm kick-off which we had never experienced before as it was normally the Saturday mad house! It was a terraces game, it was a sit in the stands game and it was probably the last small window when it was like that. Do you think Joe Fagan ever gets the credit for what he achieved? No, not at all. Everyone forgets the last six days of the Paisley reign were carnage as we lost five out our last six games in the 1982-83 season. I remember his first game in the Charity Shield when we played Manchester United at Wembley, and he made two substitutions when we were defending a corner and Bryan Robson scored to give them a 2-0 win. Joe was very much like a new boy learning on the job but I tell you something, he learned beautifully. Fagan got it right and he made the right moves. He brought in John Wark from Ipswich Town who scored some vital goals as we sealed the title. He also had Graeme Souness who was simply immense that season. Kenny smashed his cheekbone early on in the second half and was out of action until the European Cup quarter-final with Benfica and Graeme Souness also got injured for a spell. The players that came in performed brilliantly. Craig Johnston was in and out of the side but he had a fine season, we had Ronnie Whelan and Sammy Lee performed manfully. That was the year Steve Nicol emerged and was fantastic. What the players did was they worked for each other and they had a mentality because losing was unthinkable. That was the message Fagan and Ronnie Moran passed down and it was channelled through Souness who told them 'We don't lose, we win!' We went to some tough places but we just had that mentality to win. It didn't matter what XI Joe put out and they all worked for each other and won the game. I got the title from the Chris Rea song and it comes from the infamous trip to Tel Aviv where they went to prepare before the European Cup final in Rome. It was a song from Craig Johnston's record collection. Craig claims he also had Echo and the Bunnymen and The Mighty Wah in his collection as well but we all had a sneaking suspicion it was middle of the road rock! They started singing it in Tel Aviv for the first time with the trip ending up being a big boozing session! They sang it in the tunnel before the European Cup final which just warped the minds of the AS Roma players. They had Brazilian and Italian superstars and they couldn't believe it seeing the Liverpool players singing this song! The book is the story about the players and their view of how the season went. Basically it's the tale of the season. This was an era when the management were quite happy for the players to go out for a drink at night. If they played golf they would be in trouble but they were fine to go drinking! It's about a group of players who had a brand of brothers mentality and the leadership Fagan gave them, and how against all the odds they won three trophies. The book is out on Thursday, May 29, which is the day before the 30th anniversary. It's another glorious date we have in May that is stored in the memory and one you never forget. How did the idea to do this book come about? It's kind of like a forgotten season. When people talk about the great years they mention winning the European Cup in 1977 and 1978-79, and yet the treble of 1983-84 seems to go under the radar a little bit. The idea was to pay tribute to that team and also look at the way football was different. Certainly in terms of the nutrition side of the game and the stadiums it has changed completely. The bottom line about it is the teams who have groups of players who play for each other and work hard for each other and give everything are the ones that are successful. Their togetherness on the pitch was something to behold. Anyone who was there that night in Rome when we won the European Cup will remember that performance in the most hostile of circumstances. This was a group of players who would give everything for each other. How different was going to the match back then to what it is now? I know I'm going to sound like an old man at times but this was an era when you could just get up in the morning and go to the match. You didn't need a ticket and you didn't have to book a train in advance. You would just go to the station, get on a train, go to the ground and pay on the gate. There was a freedom about it, a glorious sort of looseness about it that made it all the more fun. That's one of the things I miss about the game. Back then you could go with your mates and these days if you go to Anfield everyone is split up all over the ground. I have to say the final in Rome was one of the most hostile places I have ever been to. Besides winning the game it was one of the most unpleasant experiences of my life because they were so hostile towards us. If you had to pick out a favourite memory from that season what would it be? There were so many it was untrue but if I had to go for one it would be Ian Rush's hat-trick at Aston Villa on a freezing Friday night at Villa Park. It was one of the most glorious hat-tricks you will ever see. We went 1-0 down and Rush won the game for us. There was also the first all-Merseyside cup final at Wembley. Even though it was a drab game it was a fantastic experience. I remember going down on the Saturday on the train and when we got off at Euston there were red and blue scarves everywhere! We all had badges with 'I support Liverpool city council on' and singing songs about Derek Hatton! You were proud to be Scouse and it was one of those amazing experiences. I remember the penalty shootout in Rome and 'Barney Rubble' Alan Kennedy taking that final kick. We were like 'oh no, it's Barney!' What a moment that was. When the final whistle went I remember looking around the stadium and the Roma supporters piled up all their scarves and banners and set them alight. It was like apocalypse now! For sheer football terms though it was Rushie's hat-trick at Villa. In overall terms it would have to be the joy of watching Souness that season. In terms of being the leader, in terms of being the dominant midfield player, he didn't take a step back to anyone. The man just exuded style, arrogance and brutality and he had plenty of skill - he had it all. On the pitch he was this presence beyond almost anything I have ever seen on a football pitch. He had a mean streak and he just had everything. He was an absolute joy to watch.